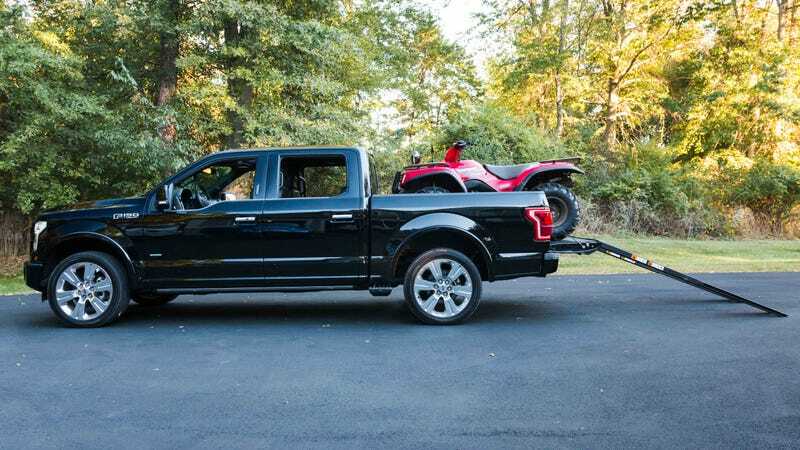 The F-150 pictured above costs $67,270. It has a number of options including, but not limited to, multi-contoured massaging seats, which help explain the ridiculous price tag. There are a few expensive features, though, that are more than just frivolous—they’re actually incredibly useful. You can very easily turn a utilitarian pickup into a full-on luxury sedan just by checking a few option boxes. Second row heated seats, carpet with premium floor mats, genuine wood accents, leather wrapped heated steering wheel, active park assist, inflatable rear seatbelts, and something called advancetrac with RSC are all features that came on the 2016 F-150 Limited I tested. Yet none of those helped me with what I really needed the truck for—moving my ATV from one place to another. The $325 box steps are certainly better than losing cargo space like the old flaresides, but they do take a bit of oomph to close and could potentially get in the way of something while driving off-road. And even though the $375 tailgate step provides the safest way to get in the bed of the truck, I much prefer how quickly I can get in using something like GM’s bumper step. The real gems here are the stowable loading ramps, and while they’re not cheap at $740 a pair, the way they integrate with the truck is really what seals the deal for me. They even come with locks to prevent someone from stealing them while you’re not around. Yes, a brand-new comparable set can be had for hundreds of dollars less, but if you’re buying a new truck (these will work on F-150s 2015 and newer with the BoxLink system), chances are you’re ready to spend a couple extra bucks anyway.